• Cable management: Design cord cover: self-closing cable cover / cable sleeve for quick bundling, hide and tidy away cables at home, in the office, agency, practice and workshop. • Cable tidy: Easy to cut to individual length without causing the fabric to fray. The flexible and robust cable trunking adapts perfectly to the number of cables (diameter 2.5 - 4 cm). • Cord protection: Cables can be inserted in to and taken out of the cable wrap through a small incision without breaking the sleeve. Ideal for nooks, corners, and sharp angles. • Easy cord organizer: lateral opening for the easy insertion and removal of cables, wire cover can be fitted without disconnecting the equipment. Perfect combined with a cable box. 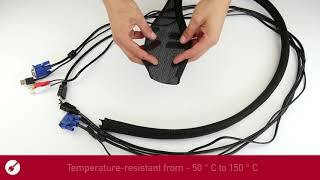 Designer Cable Management cord cover LTC CABLE TUBE: never again r/cablefail/! With the cable cover LTC CABLE TUBE cables are quickly bundled, protected and hidden. It is also possible to attach the cable sleeve without unplugging devices simply through lateral opening of the self-closing polyester material. Insertion or removal of individual cables in the cable sleeve is not a problem either. The LTC CABLE TUBE is very flexible and so also perfectly suited for sharp corners and tight angles. The diameter of the cable trunking is from 2.5 - 4 cm and adapts to its contents, so the wire cover is never thicker than needs be. The high-quality cable organizer product is also very easily cut to individual length without fraying. To do this, simply cut the edge of the fabric sleeve with scissors or a knife. Additionally, a cable can easily be inserted in to or removed from the cable sleeve without having to break the sleeve through a small lateral incision. LTC CABLE TUBE complies with safety standards and is temperature-tested from -50 to +150 ° C. The wire hider is designed and suitable for large loads, but is also ideal for use at home, in the office, in the workshop, and for computer and monitor cables under the desk. Say goodbye to r/cablefail/ with LTC CABLE TUBE. Concealing, tidying away, bundling and storing cables have never been so easy! More links for "LTC Cable Tube, Cable Management Cord Cover Self-Closing & Adjustable Cable Cover (black)"